It’s a skill not even every human possesses: skating on ice. But a Swiss robot dubbed “Skaterbot” managed to learn. The maverick quadruped belongs to Stelian Coros, a professor at ETH Zurich’s Computational Robotics Lab. Skaterbot was shown off at a local ice skating rink during last month’s World Ecosnomic Forum in Davos, Switzerland. An official video shows Skaterbot competing with players from the local hockey club. Coros told the robot how skates behave on ice, then let it learn its own skating technique. Skaterbot can even do tricks, like learn how to skate with more than four legs. The team envisions the robot to be useful during search and rescue missions, and could even be used for deliveries. But for now, Skaterbot still has a lot to learn. 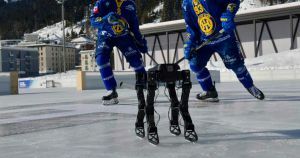 “Considering that these are our first baby steps on ice, I think that our robot did quite well,” Coros told ETH Zurich.